My dad is a meat and potato guy. Just about every meal my mother served up with a version of red meat, some variety of potato and vegetable from the garden; sweet corn, purple hull peas, fork hook lima beans, squash or orka (which we dutifully FRIED!). The one dish that diverted routine was Chicken and Rice. It was a dish that my dad grew up eating and requesting for special occasions. I never learned how to make it myself, so when I saw Chef Jeff Henderson with Flip My Food making it on the Crave Gourmet & Gifts episode, I was thrilled! I am saving this to my recipe box and hope you’ll try it out for yourself. 1. In deep large cast iron skillet, heat oil over medium-high heat. 2. Season chicken with salt, pepper, onion powder, garlic powder, thyme and cayenne. 3. Pour flour into a large bowl and dredge chicken in flour. Reserve the flour. Place chicken into hot skillet and brown in 2 batches for about 4 minutes on each side or until golden. Remove chicken from skillet and place on a plate lined with paper towels and set aside. 4. Add onions to skillet and sauté for 3 minutes. Whisk in flour and pour in chicken stock, stir constantly until mixture comes to a boil. 5. 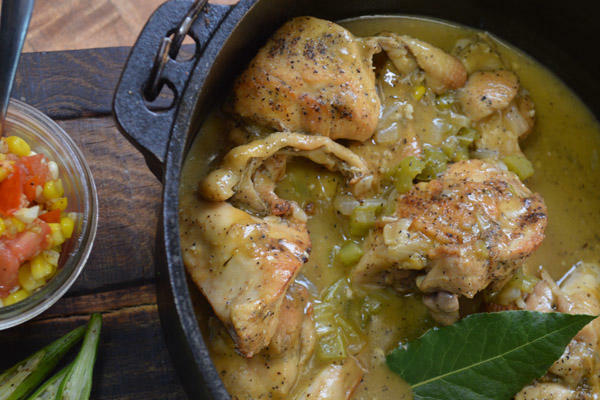 Return chicken to skillet, cover, and continue cooking for about 30 minutes or until chicken parts are tender and gravy has thickened. Adjust flavor by adding ore seasoning if need be. Serve with rice and select vegetables. Find more Cajun Recipes here. To learn more about Flip My Food, visit www.flipmyfood.com.